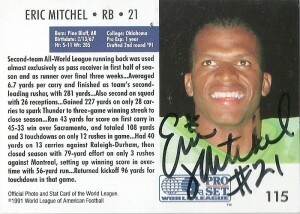 A backup runningback to Barry Sanders, Eric Mitchel was drafted by the New England Patriots in 1989 during the 6th round from Oklahoma. A tremendous athlete with deceptive speed Mitchel would not make the final roster of the Patriots. Instead he’d go onto greater glory in the WLAF drafted in the 2nd round of the positional draft by the Orlando Thunder in 1991. Mitchel would be used primarily as a receiver through the first half of the season, but soon thereafter was inserted back into his native runningback position. He’d tear it up- rushing for an impressive 6.7 yards a carry. Eric even got some kick return time in with 276 yards on 8 returns, and a whopping 34.5 yards. 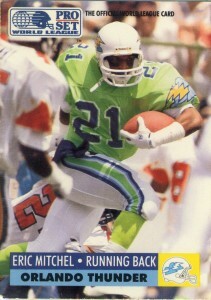 The Ultimate 1992 card also depicts him making a throw- which he completed for a touchdown of 53 yards. His impressive all around 1991 season would ultimately result in Eric being named 2nd team All World. Eric would return to the NFL in 1992 signing with the Cowboys, but was waived in March of that year. Mitchel would move up to the CFL where he signed with the Edmonton Eskimos helping them win the 81st Grey Cup in 1993. In 1994, Mitchel would play for the Las Vegas Posse in the CFLUSA, -unfortunately the most unsuccessful CFLUSA team. After 9 seasons in football, Mitchel retired but has spent time in real estate in and around Dallas, Tx. Of note, you probably have seen the former Thunder player on late night TV as if you look closely at the security detail- you may just see him on the TV show “Cheaters” as one of the blurred out private investigators.